Earlier last month (once the rain had stopped) our small band of field workers managed a return visit to this site, which lies on the south side of Lamberhead Green in Pemberton (ref: Newsletter 159). The goal was to see what features could be recorded and select station positions for a plane table survey. Maps supplied by Norman Redhead at GMAAS showed that buildings survived on this site as late as 1955; however not much evidence of these are left on the ground, even the track leading to them could not be identified. 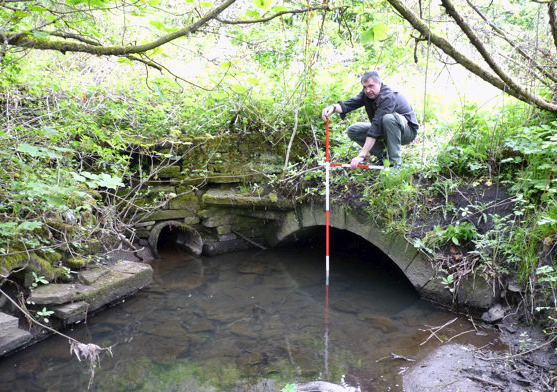 Using a steel probe, foundations could be detected in several places on the south side of the brook; however, at present, our intention is only to survey above-ground features. An old stone wall, running on the north side of the brook, marks the spot on the maps where the Pingot well used to be. The entry and exit of the stone-lined culvert under the track, is also well defined. The lime kiln, which we identified on our last visit embedded in the embankment on the north side of Brook Lane, would also be included in our survey. We set up our plane table near the entrance to the site, in a position which gave good visibility to all these features. Recording them required removing undergrowth to make way for our tape. As we cleared the vegetation from the area between the old wall and the brook, we came across a large stone slab. It appeared to have been moved to reveal underneath a one metre deep bricklined sump with the sound of running water coming from it. Could this be the famed Pingot well? Inside we could see clean water issuing from the nearside and a sluice gate on the far side looking like it could have been used to control the water flow. We also spotted a cast iron pipe in the bank of the brook where the water was discharging into it. It is fascinating to think that this could be the spot where, in the distant past, carts would queue up to fill barrels for the supply of fresh spring water to residence all over the Pemberton area. Next time we will have enough information to carry out a detailed survey and, if we can get permission, expose some of the foundations that undoubtedly remain of the 18th century buildings. For more details of our visit, check out our blog site. This year our trip will be on Sunday 28th July when we will be visiting some very interesting sites in North Wales. Of particular interest will be the excavations of an Iron Age Hill near a town called Bodfari. Gary Lock from the Oxford University has agreed to give us a guided tour. Also on the itinerary is the Medieval Castle at Rhuddlan and also a nearby Celtic Cross named Maen Achwyfan which is near the town of Whitford. On the way back we will be visiting the 12th-13th century Basingwerk Abbey near Holywell which lies in the grounds of Greenfield Valley Heritage Park. This Park also contains some very interesting archaeological sites from the 18th century, including the copper and brass manufacturing industry. If you haven't got your name down yet, contact myself or Mary at the next meeting. Wednesday 5th June - in the Standish Suite at the Brocket Arms (7.30pm as usual). Ron Cowell is Curator of Prehistoric Archaeology at Liverpool Museum and he has agreed to come along and tell us about his remarkable discoveries in recent excavations on a site near Sefton on Merseyside. The site is on farmland near the River Alt which is being converted into a nature reserve. Ron's excavations have revealed a Mesolithic settlement dating from 5800 BC. 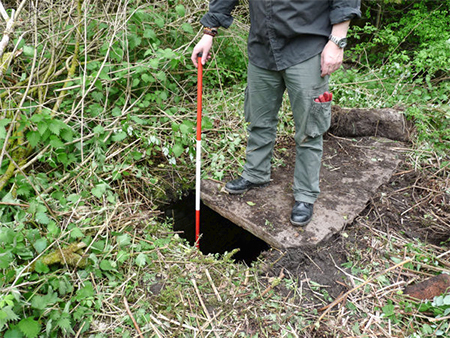 What is remarkable however is that Ron believes he may have found evidence for three dwellings. If true, this would be the first time evidence that these nomadic huntergatherers were making permanent or semipermanent settlements had been found. Sounds like a great talk - hope to see you there, BA.